$6.00 Medal for 20th Anniversary of Victory over Germany. In excellent condition. $5.00 Document for 20th Anniversary of Victory Medal. $3.00 Medal for 30th Anniversary of Victory over Germany, to a WW 2 veteran. Excellent condition. $5.00 Document for 30th Anniversary of Victory Medal, to a combat veteran. $4.00 Medal for 30th Anniversary of Victory over Germany, to a veteran of WW2 labor front. Excellent condition. $3.00 Medal for 40th Anniversary of Victory over Germany, to a WW2 combat veteran. Excellent condition. $4.00 Medal for 40th Anniversary of Victory over Germany, to a veteran of labor front	Excellent condition. $5.00 Document for 40th Anniversary of Victory Medal. $550.00 Medal for 40th Anniversary of Victory over Germany, Variation 3 (so-called "Foreign Version"). In excellent condition. $660.00 Medal for 20th Anniversary of RKKA, 1938. In very fine to excellent condition. Comes on a Type 2 suspension WW2 era, with old ribbon. $3,300.00 Medal for 20th Anniversary of RKKA, Type 1, with award document, awarded in 1939 to a Military Engineer Major. Both the medal and document are in excellent condition. The medal includes original and complete Type 1 suspension showing the serial number matching the document. A very rare matching set. $19.00 Medal for 30th Anniversary of the Soviet Army and Navy, 1948. In excellent condition, and includes original brass suspension and old ribbon. $12.00 Document for Soviet Army and Navy 30th Anniversary Medal, 1948-49 issue. $15.00 Medal for 40th Anniversary of the Soviet Armed Forces. Excellent condition. $22.00 Document for Soviet Armed Forces 40th Anniversary Medal, 1958 issue. Excellent condition. $6.00 Document for Soviet Armed Forces 50th Anniversary Medal. Excellent condition. $3.00 Medal for 60th Anniversary of the Soviet Armed Forces	. Excellent condition. $5.00 Document for Soviet Armed Forces 60th Anniversary Medal. Excellent condition. 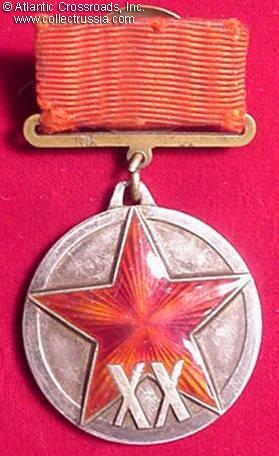 $3.00 Medal for 70th Anniversary of the Soviet Armed Forces	. In excellent condition. $4.00 Medal for 250th Anniversary of Leningrad, 1957. In excellent condition. $10.00 Document for Leningrad 250th Anniversary Medal. Excellent condition. $195.00 In Commemoration of the 250th Anniversary of the Founding of Leningrad, 75 mm table medal in bronze, with original fitted case of issue. Very scarce 1957 medal, one of only 620 struck. $7.00 Medal in Commemoration of the 1500th Anniversary of Kiev. In excellent condition. $18.00 Medal for 800th Anniversary of Moscow. In Excellent condition and includes original brass suspension. $15.00 Document for a Moscow 800th Anniversary Medal, to a female recipient. In excellent condition. $5.00 Lenin's Centenary Medal for Valiant Labor, 1970. Excellent condition. $8.00 Document for Lenin Centenary Medal (Labor issue), 1970. $590.00 Lenin's Centenary Medal, Var. 3 - issue to a foreigner, 1970. Comes with original fitted issue case. In near mint condition. $10.00 Medal for 50th Anniversary of Soviet Police. In excellent condition.